The optical method is based on the simple principle that light interacts differently with xylem that is water filled vs air filled. This is caused by the way light reflects and refracts as it encounters air-water interfaces. These interactions are most apparent when you consider a body of water, such as the ocean. Ocean glare is caused by sunlight reflecting off the surface (an air/water interface) and the distortion and shift in position of your hand when you place it under the water is caused by refraction – a slight change in direction that occurs when light passes from air into water. 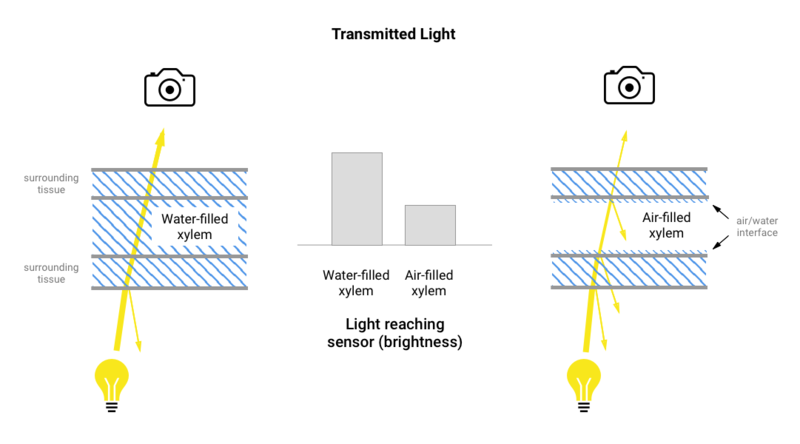 By capturing images of the xylem over time, and comparing the differences between captures, it’s possible to extract and quantify the subtle changes in brightness caused by xylem cavitation – see Capture for more information and the Gallery for examples of the extracted differences. 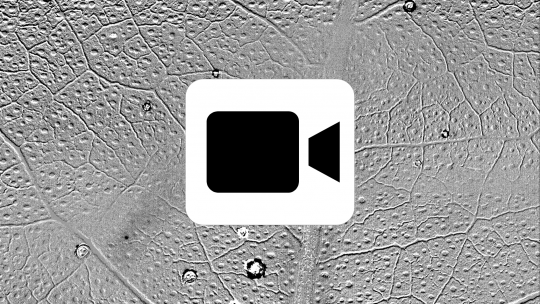 Initially images of the xylem were captured using high-speed cameras with macro lenses, or digital cameras mounted on microscopes, but researchers quickly realised that the principle could also be applied using cheaper imaging equipment, such as off-the-shelf document scanners. Aside from the cost, document scanners have other benefits – the glass screen provides an ideal surface for sample mounting and multiple samples can be positioned and imaged within a large scannable area. In addition, the resolution and image quality achieved by some of the high-end document scanners can be exceptional, and in some cases much better than their digital camera counterparts. The application of desktop scanners does however have limitations. The size of the scannable area on the one hand is a benefit, but on the other makes the unit bulky and awkward to move and position, which can be an issue for example where you want to measure in the field or sequence multiple regions from a large branch. A more fundamental problem relates to the mechanical nature of the imaging process itself. Most desktop scanners are simply not engineered for continual scanning, and samples can require imaging over several days with only minutes between scans. Overheating, jamming, and inconsistent speeds of the read head can lead to artefacts that can begin to appear as the machine ages. These issues tend to surface much later in the more expensive machines with a better build quality, but cost is not always an indicator of quality, so this often cannot be taken as a rule. Replacing parts, or indeed entire scanners, is an option, but it is clear that the ideal setup involves a non-mechanical capture process, and this inevitably leads back to a system that employs digital cameras.